Sometimes, when you’re wondering where that ancestor disappeared, an obituary will provide the answer. But not their obituary! Relatives doing family history have asked why I have spent time researching branches of the family tree that are not my direct ancestors. The answer is a bit convoluted .. just like the route to finding my direct ancestors. Sometimes the trail for my family tree goes nowhere. But tracking the siblings of my ancestors may be a route around the roadblock that will lead right to my ancestor .. or to a cousin who may know other details I’m looking for about our common ancestors. Case in point: the Wilsons of Aylwin, QC. That’s the family of my great grandmother, Eliza Wilson. They are from Scotland, all the earliest records show this. But where in Scotland? Her father, Robert Wilson, first appears in Huntley (near Carp, where Eliza is born), then Nepean, and finally Aylwin QC. Robert was a tanner, the likely reason for his early death. When his wife, Annie Graham, remarries and ends up in Gloucester with her younger children and new husband, Eliza meets a next door neighbour .. and eventually marries John ‘Jake’ McEwan. Some of her siblings seems to disappear. 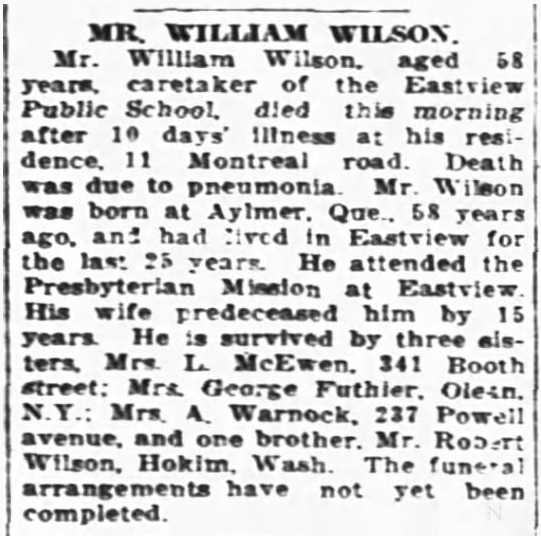 An obituary finally puts her brother William Wilson in Eastview (Ottawa). And her brother Robert? Listed among the survivors is Robert .. of “Hokim, Wash.” That would explain why Robert disappeared completely. He was among those who headed to the United States during the logging boom of the early 1900s. US Census records subsequently show him first living in Wisconsin (where he marries) and then in Washington State, near Seattle. Thanks to a Google search, it was easy to find that he had lived in Hoquiam, Washington. Obituaries prove the point that much of what appears in historic newspapers was really hearsay .. it was what the reporter heard them say! Important then not to get hung up on the mistakes, like Eliza McEwan becoming L (for Liza) McEwan .. but at the right address! Are we a little closer to finding someone who knows the family origins in Scotland? Hopefully! I’m working on a Hoquiam Family Reunion for the Wilson descendants of Robert in May 2016 .. along with another group of Wilsons in the Hoquiam area .. possibly Robert’s uncle’s family?